HJ: Life is full of challenges. This is unavoidable. Therefore it is all about how you navigate these challenges. 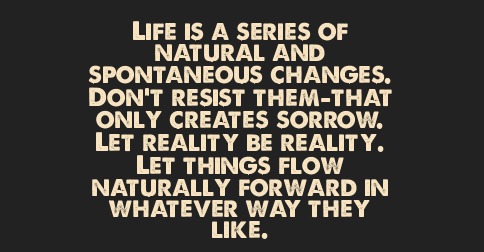 Do you do it with flow, joy and grace or struggle and suffering? Today’s article is all about doing it with flow, joy and grace and severely reducing or eliminating the struggle and suffering. Because when all is said and done, these are NOT necessary. Don’t stress. Do your very best. Appreciate each step. Forget the rest. Stress is one of the primary causes of major health problems in our lives: it can cause heart disease, anxiety, sleep deprivation, auto-immune disorders, weight problems, unhappiness, and even deep depression. But we’re busy – we all have places to be, things to do and people to see. So how do we alleviate stress and still get our work done right (without neglecting our loved ones and ourselves)? When life gets crazy busy, you might not have time for week-long meditation and yoga retreats, weekend vacations, or even weekly life coaching sessions. So what can be done? I’m going to be brief about this, because time is of the essence. There are nine simple things you can do. A few mindset shifts and a couple actions that take only a couple minutes. These can’t solve the most severe stress related problems, but they can help most of us in a major way, every day. 1. Be in the moment, completely, with just one task. 3. Accept people just the way they are and smile. We get upset with others because they don’t meet our fantasy of how they ‘should’ act. Instead, try accepting them for who they are, and recognize that, like you, they’re imperfect and seeking happiness and struggling with finding it. They’re doing their best. Accept them just the way they are. In most cases it’s impossible to change them anyway, and it’s rude to try. So save yourself from needless stress. 4. Take a brief walk outside. When things are getting really stressful, take 5-10 minutes to take a walk and clear your mind. A short walk does wonders. It gives you something new to look at and it gets your body moving. Through a decade of life coaching we’ve found that people who have recently experienced stressful life events like a serious illness, death of a loved one, marital separation or job loss, always see an immediate mood boost after a short outdoor walk. It’s literally the most effective way to instantly reduce the stressful pressure of a worried mind. 5. Perform short mindfulness practices. 7. Consciously squash the needless comparisons. 8. Track what’s going well and give thanks. In a study of exercise’s effectiveness by Martin Seligman, participants were asked to follow those exact instructions for just one week. After one week the participants were measurably 2% happier than before, but in follow-up tests their happiness kept on increasing, from 5% at one month, to 9% at six months. Even more interestingly, the participants were only required to keep this gratitude journal for one week, but the majority of them continued journaling on their own because they enjoyed it. And remember that most people cope with stress in unhealthy ways – drinking alcohol, smoking cigarettes, eating sweets, arguing with people, mindlessly watching TV, procrastinating, and so forth. Ironically these activities often cause more stress. So don’t do this to yourself. Instead, use the ideas I’ve provided to cope without these unhealthy crutches.